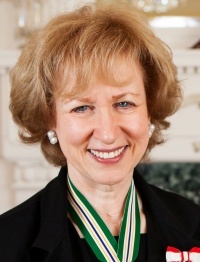 Biography | The Right Honourable Kim Campbell, P.C. ; C.C. ; Q.C. Seek wisdom. Conquer fear. Do justice. From 2004 through 2006 Ms. Campbell served as Secretary General of the Club of Madrid, an organization of former heads of government and state who work to promote democratization through peer relations with leaders of transitional democracies. Ms. Campbell is a founding member and is still an active member. She additionally has served as its Acting President in 2002 and Vice President 2003-2004 and sat on the Board of Directors from 2007-2011. In 2016, Ms. Campbell served as the chairperson of the Independent Advisory Board for Supreme Court of Canada Judicial Appointments, a role that she reprised in fall of 2017. She chaired the steering committee of the World Movement for Democracy from 2008 to 2015 and was chair of the Council of Women World Leaders (CWWL) from 1999-2003. The Council's membership consists of women who hold or have held the office of President or Prime Minister. From Oct. 2003 - Oct. 2005, Ms. Campbell served as President of the International Women's Forum, which advances leadership across careers, cultures, and continents by connecting the world's most preeminent women of significant and diverse achievement. Today, Ms. Campbell devotes much of her time to serving as the Founding Principal of the new Peter Lougheed Leadership College at the University of Alberta, and she is a trustee of the Int'l Ctr for the Study of Radicalisation and Political Violence at King's College London. She is a member of the Pacific Council on International Policy, (the West Coast affiliate of the Council on Foreign Relations) as well as the the Global Council of the the Asia Society New York. She is on the advisory board of Equal Voice and Apathy is Boring, as well as an honorary patron of Informed Opinions. She is also a senior advisor to the International Crisis Group and an honorary board member of the Climate Action Reserve. Ms. Campbell is a member of the board for Athenex, a pharmaceutical company that had its IPO June 14, 2017 and trades under the ticker symbol "ATNX". Her corporate director experience also includes the high tech, bio-tech and medical devices industries. Kim Campbell was educated at the University of British Columbia (BA, 1969, LLB, 1983) and the London School of Economics (Doctoral studies in Soviet Government, ABD, 1970-73) where she's an Honorary Fellow. She holds several honorary degrees. The 4th Edition of her best-selling political memoir Time and Chance was released via Kindle in March of 2017. Find it on Amazon.com, Amazon.ca, or your country's Amazon website. 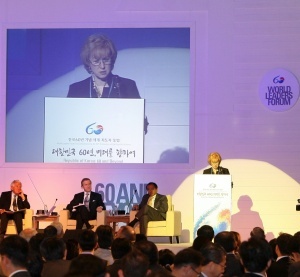 Ms. Campbell consults and speaks widely on issues related to leadership, international politics, democratization, climate change, gender, and Canadian/American relations. For information on how to request the Right Honourable Kim Campbell as a speaker, visit the American Program Bureau, or in Canada visit National Speakers Bureau. Ms. Campbell is married to composer, pianist, and actor, Hershey Felder.